^ Euclid's Elements, Book I. mathcs.clarku.edu. [2017-10-21]. ^ Archived copy (PDF). [2013-06-20]. （原始内容 (PDF)存档于2014-05-14）. 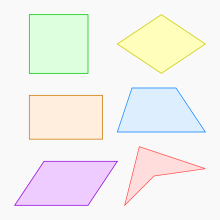 ^ Radic, Mirko; Kaliman, Zoran and Kadum, Vladimir, "A condition that a tangential quadrilateral is also a chordal one", Mathematical Communications, 12 (2007) pp. 33–52. ^ Bogomolny, Alexander. "Inscriptible and Exscriptible Quadrilaterals", Interactive Mathematics Miscellany and Puzzles. [2011-08-18]. ^ G. Keady, P. Scales and S. Z. Németh, "Watt Linkages and Quadrilaterals", The Mathematical Gazette Vol. 88, No. 513 (Nov., 2004), pp. 475–492. ^ A. K. Jobbings, "Quadric Quadrilaterals", The Mathematical Gazette Vol. 81, No. 491 (Jul., 1997), pp. 220–224. ^ R. A. Beauregard, "Diametric Quadrilaterals with Two Equal Sides", College Mathematics Journal Vol. 40, No. 1 (Jan 2009), pp. 17-21. ^ Stars: A Second Look (PDF). ^ Harries, J. "Area of a quadrilateral," Mathematical Gazette 86, July 2002, 310–311.